How you describe yourself is a pretty good indication of how you see your place in the world. Most people start off with their occupation, “I am an engineer…”. Some site past achievements, others family relationships. I think a major source of how you describe yourself must do with your future. It must be how you want to spend your remaining years on this earth. Your self-description should be about your future, not your past. With that in mind, letting go of your “have been” life how would you describe yourself? I maintain three blogs and a couple of photography sites and I certainly am a skeptic about certain aspects of life. I only recently started calling myself a Christian again and that is because I shed the Evangelical label and adopted the Progressive one. 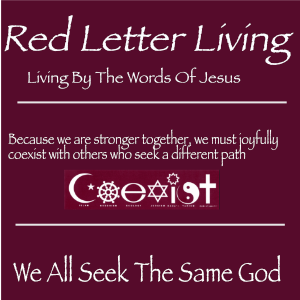 (see my blog at RedLetterLiving for more about that.) One of my passions is photography particularly documenting the historical places I have visited. Looking to the future, however short it is, these are the descriptions that I put on myself. As the new header says the GOP just loves to cut taxes but that is the easy part. They just don’t seem to be up to the more difficult part of cutting spending, or at least cutting it where a majority in Congress will agree. They most often propose to cut entitlements as they call them. Those are things that help the average citizen along in life. Things like Social Security, food for the poor, healthcare for those who can’t afford it are near the top of the chopping block list for them. They don’t seem to realize that we are a nation that cares for the welfare of our citizens. We, as our constitution says, promote the general welfare of our citizens. We care for each other. The ironic part of the enigma related to this is that most of the GOP claim that the US is a Christian nation. Jesus, who is the foundation of Christianity, said the two most important things in life are to love God and to love each other. It’s hard to make anyone believe we love them while at the same time stripping a safety net out from under them. I saw something the other day that shows that for the last forty years or so the Democrats have been more fiscally responsible than the GOP. One of the biggest flaws of the GOP is that they can’t stop throwing money at our war machine, even when they don’t need it.